Rory McIlroy speaks to the press in the flash zone after his 67 on Saturday. On Sunday he gave it a miss as he dashed to catch a flight to see girlfriend Caroline Wozniacki in Cincinnati. Picture: Eoin Clarke www.golffile.ieRory McIlroy was annoyed that he didn’t make an even bigger run at Jason Dufner in the final round of the US PGA. But despite the disappointing triple bogey that wrecked his final round charge the two-time major winner reckons his share of eighth confirms his slump is over and he can still “salvage” his season. Insisting he’s ready now to repeat his feats of late last year and launch and mega-charge for FedEx Cup glory starting in New Jersey next week, McIlroy said: “It’s great. It gives me a lot of confidence going into these playoffs. McIlroy didn’t hang around after his TV and radio interviews and made a beeline for the locker room, changed his golf shoes and bashed them on a locker door as he headed Cincinnati to watch girlfriend Caroline Wozniacki in action this week. His irritation was understandable and a sign that his competitive spirit is alive and week. Nevertheless, it was a shame that he missed an opportunity to gave the waiting written press two minutes to ask a few questions in the flash area, thus avoiding the hassle of being being bombarded with questions in the changing room and on his way to his car and as his belongings were being packed into the boot. No doubt he’s frustrated he’s ended 2013 without adding to his major haul but with the $10m FedEx Cup playoffs starting next week and the Race to Dubai finale still to come, he’s looking on the bright side. Recalling how he won four times late last year to win Player of the Year awards on both sides of the pond and confirm is status as world No 1 at the time, McIlroy feels ready for a repeat. 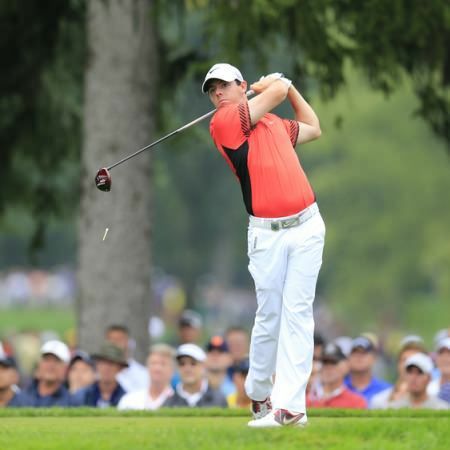 Rory McIlroy plays his approach to the 18th in the final round of the US PGA Championship at Oak Hill. Picture: Eoin Clarke www.golffile.ieReflecting on his closing 70 and the triple bogey seven at the fifth that killed his final round change, he said: “I saw a lot of great signs out there today. McIlroy will head from Cincinnati to Liberty National to practice for The Barclays and major legend Jack Nicklaus believes he just needs to work on his swing and forget all about his off-course management bust up with Horizon Sports. McIlroy has played poorly since making his huge move to Nike in January and is already looking after his own day to day management affairs with the help of his father and a small coterie of friends. His equipment change has been touted as one of the reasons for his loss of form this season but 18-time major winner Nicklaus dismissed the clubs as a non-issue and urged McIlroy to concentrate on golf and let others handle the rest. Nicklaus told Sky Sports before the final round in Rochester: “I said something to Rory at The Memorial Tournament. I said Rory, you’ve got to fix your takeaway from the ball. Rory’s takeaway he will take the club to there and then take his hands up and outside and gets the club behind him and then he is going to hit it anywhere. “The opening tee shot that he hit in on Thursday, he took the club perfecty away from the ball, hit a perfect tee shot, played a few good holes and all of a sudden by the sixth or seventh hole I saw him go back to his old habit. As for his McIlroy’s off course problems this year, Nicklaus dismissed the Nike move and recalled how he had a massive financial problem in 1986 and still won the Masters. The Golden Bear said: “I had to deal with off course problems almost all the time. If you are living life you are going to have problems. “We all have problems, we all have things that take up our time. “Rory shouldn’t be having to worry about those problems. He should be having that taken care of and I think his father helps him quite a bit. "Rory's more like Jack than Tiger - it isn't life or death stuff"
The close bond between father and son was there for millions to see on Sunday night. Photo Eoin Clarke/www.golffile.ieThe old adage that a picture is worth a thousand words rang true once more. There was Rory McIlroy, just 23 and already a two-time major champion, soaking it all in. Watching proudly from the ropeline was his father Gerry, who has always said that these are Rory’s dreams not his own or those of his wife Rosie. Short back and sides but he’s still got a mop on top. Rory McIlroy shows off his hairdo at Oak Hill. Picture: Eoin Clarke/www.golffile.ieForget about his video reminders, his haircut, his desire to prove people wrong or his insistence on solving his problems his way. Rory McIlroy is looking beyond this week’s US PGA to the day when his game is back in shape. There’s only one gold standard and it’s not set by the press. Put simply, There’s just one man he wants to beat - Tiger Woods.